I have been drawing and painting for as long as I can remember, and my interest in plants and things Botanical has been ever present in my life. When I married, my first home, a small flat in the centre of town, was dubbed Kew Gardens by my family and friends, who would battle the profuse growth of herbage to come visit. Despite my interest in plants and painting, it was only a couple of years ago that I had the opportunity to think about a course to hone my skills. The most relevant courses were full time and/or based in London, neither of which were suitable to someone based in Wales with family commitments. It seemed distance learning was the best option, but how to find a really demanding course? I did a few short Botanical Painting courses at the National Botanic Garden of Wales and found I really enjoyed the discipline. And of course, that was when I broke my arm, just above the wrist. The left arm, the hand I write, draw and paint with -naturally. There's nothing like having an incentive to make you do your physio, and once I was getting full movement, the real work started. I had to teach my fingers how to hold and control paintbrushes again, and not drop them all over the paintings or flick them to the floor! After six months of Kolinsky Sable brushes flying all over my studio area and unexpected daubs of paint landing on my artwork, I felt ready to do the Introduction to Botanical Illustration weekend course at the same venue and found that it was like coming home. I wanted more! Researching courses online, I found a post by Katherine Tyrrell, on her Making a Mark Blog, about the artist, Shevaun Doherty, painting carrots in the middle of the Egyptian revolution. And that's when I learned about the Society of Botanical Artists. It was like being struck by lightning. I had to apply for a place on the SBA Distance Learning Diploma Course. I rummaged through my paintings for something half-decent and sent off the letter of application with a sample of my work. I didn't tell them about my arm, just sent in my application and hoped they'd accept me on the course. And after a long wait, I received the offer of a place. My Botanical adventure had begun. That's a lovely study Polly - I look forward to seeing more. Thanks for the mention in your post - let's keep paying it forward! You might like to hear about how Shevaun came to be doing the SBA Diploma in the first place - which you can read about in Why be an art blogger? Thanks Katherine, I have just read that post, it's so inspiring. I have been in touch with Shevaun, she's the most amazing person. I've also had the pleasure of rifling though her sketchbook at the SBA last year - it is truly awe inspiring! Hi Julie, I haven't figured this one out yet Can't find it on the widgets page, unless it's google+ followers, is this what you mean? Hi Polly if you look at my blog, you can see the followers app on the right and side of my posts. I think you do it through google friend connect! Hi Polly! I look forward to following along (saw on Botanical Artists on FB.) Love seeing your work. Thank you Carol, you're very kind. I'll have a follower icon as soon as I've figured it. 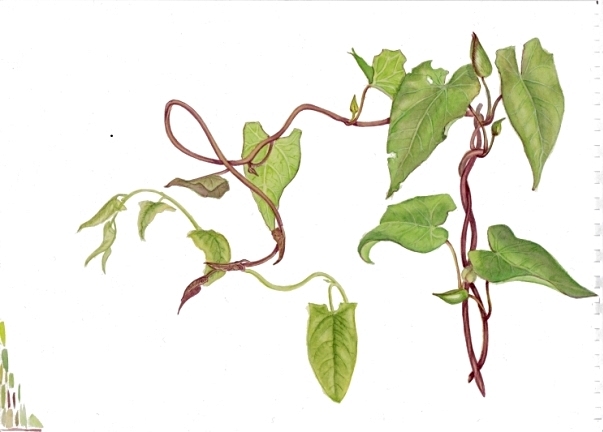 Thank you Shevaun, the Bindweed is one of my favourites too, I've saved that page as it's so interesting. Clearly the Ancient Egyptians knew a good thing when they saw it. Do you have a blog or website I can put a link to? Well done on starting the blog Polly - and of course you know I love your artwork ... I am sure you will do very well on the course. Thanks Vicki, it's following bloggers like you has inspired my to try a blog myself. Thanks Claire. I'm wondering if there's a Botanical Artists group in Wales? I haven't found one, but it might be a good way of publicising Welsh Botanical Artists? Polly, Welcome to the world of bloggers! I enjoyed reading about how you got started on the course--I felt electrified when I first found out about it too. I heard about it, sent in my application and was accepted in about a month! I love your work and look forward to following your artistic journey. So lovely to fond your blog! I look forward to following along. I also had a broken arm and hand right before the course and totally understand about trying to get control back into your fingers and hand. I could never had guessed by looking at your lovely work that anything had ever happened to your dominant hand. HI Laura, I had a good physio and really pushed myself to get back the function. I also play violin and mandolin, so when the consultant heard that he made sure that the setting of the bones was as good as it could be. Playing Mandolin is good physio too and I only stopped for two weeks !! Pain? pah! I laugh in the face of pain...actually, I cried - a lot.